Last updated on June 15, 2015 June 16, 2015 by Daniel Waldron for Armagard Ltd.
A combination of heat, humidity and H20 are a death sentence for digital signage screens. If you need poolside digital signage, you don’t want to miss Armagard’s latest blog. British Swimming is the National Governing Body for Swimming, Diving, Synchronised Swimming, Water Polo and Open Water in Great Britain. It has an international responsibility to ensure the high performance representation of the sport. Requiring 60” screen protection for their facility at the University of Bath Sports Training Village, British Swimming came to Armagard. The solution needed to be able to endure the rigours of a swimming pool environment, staving off the effects of humidity, temperature changes, and provide protection against water damage. 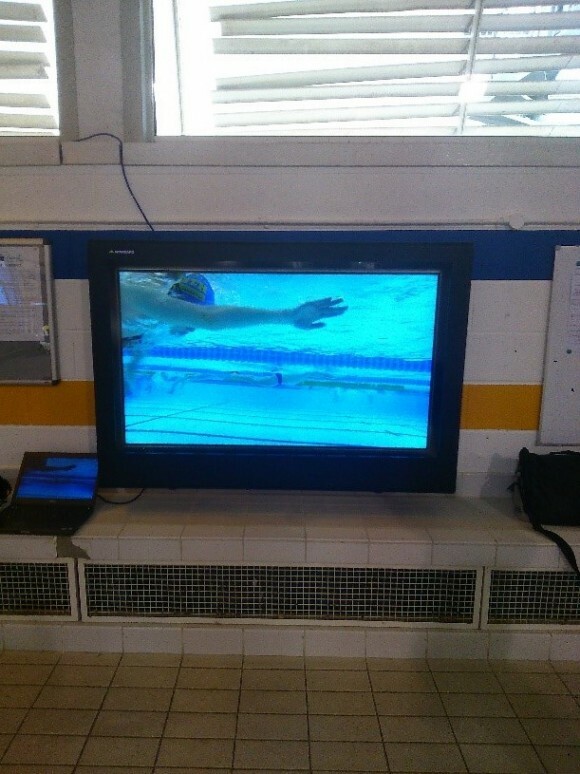 Performance Scientist for British Swimming, Ben Holliss, came up with the idea of installing poolside digital signage for use as a coaching tool. 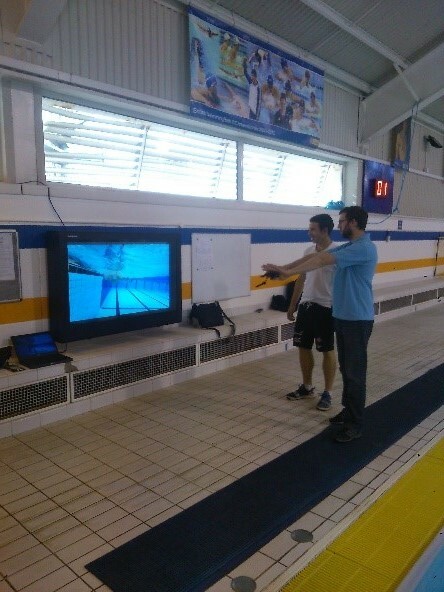 The installation of a 60” poolside screen enabled swimmers to view themselves on screen while training, helping them to improve their swimming technique. British Swimming installed an Armagard 60” enclosure from our PDS range, an IP66 industry rated unit that’s completely watertight. The enclosure was equipped with temperature regulating systems to cope with changes in humidity and to stave off the effects of condensation. The unit is fitted with a polycarbonate viewing window, which is 10 times stronger than glass, to protect against any accidental collisions. Various security features are also attached to the unit to prevent theft and the enclosure also protects the screen from vandalism. Manufactured using a rust resistant, powder coated mild steel, and sealed to industry standards, the PDS LCD enclosure is an indoor and outdoor ready unit. It can be used for industrial and commercial purposes and is available in a variety of sizes ranging from 24” up to 75”, keeping screens functioning in temperatures as low as 0oC and up to +50oC. The unit is fully watertight, a must have feature for British Swimming’s project, and is completely dust proof. It’s low maintenance and easy to clean with standard cleaning products. The PDS LCD enclosure can be wall, pole-stand or ceiling mounted, while screens are mounted using a universal VESA mounting bracket. One of the unique benefits of this unit is that it’s completely customisable. Choose from a toughened glass or polycarbonate viewing window, add anti-glare or anti-reflective technology to maintain screen visibility in bright locations or add a touch screen feature for increased user interactivity. 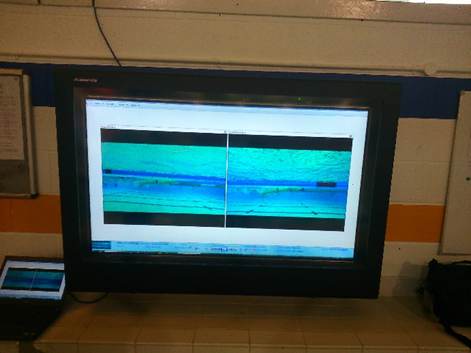 The Armagard PDS LCD enclosure makes it possible for swimmers to review real-time footage of their training. Swimming trainers are also able to observe techniques, without having to have their eyes on the pool. They can also rewind and playback footage for review in greater depth. Designed to last for up to 10 years or more, the screen will be protected from a number of damage threats, preventing the need for screen repair/replacement and reducing costs. Compared to a dedicated waterproof screen, the PDS LCD enclosure can cost up to 50% less and can protect your current screen, removing the need to invest in an entirely new, more expensive solution. The unit blends seamlessly into the environment and its protection of the digital screen enables swimmers to enjoy a live, interactive view of their training as they take to the pool. Like British Swimming, public swimming baths can benefit from poolside digital signage. How? Poolside digital signage can best serve as an emergency exit guidance system, an aid for lifeguards or, if there is no lifeguard, poolside digital signage serves as the focal point if evacuation of the swimming pool is required. It can also be used to display safety information during pool opening hours. Digital signage emanates presence, capturing the attention of pool users. It certainly gets the message across more poignantly than static displays. Overall, the presence of poolside digital signage will improve safety. 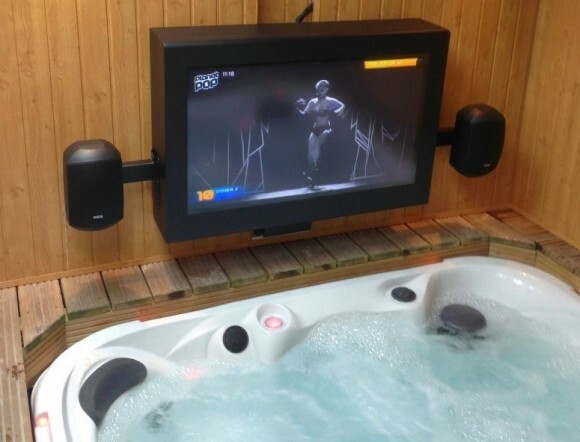 Having a screen poolside is not restricted to public baths, you can install one at home. Whether you have a Jacuzzi pool or a full-size swimming pool, installing a TV is available to you, taking home entertainment to a whole new level. To discuss your poolside digital signage project, get in touch with Armagard today on 0121 608 7226. With over 20 years of experience manufacturing protective units for screens, and with experience of installing digital signage poolside, you can rely on us to find a solution for you. Digital Signage Displays – Can they Work in Hippodromes? Digital Signage Costs: How Much Will Your Digital Signage Project Cost You, Really?